1859: born in Nagoya in the district of Suehiro-chô. His father Sobue Hyôe is in the money-lending business. 1869: his father becomes the producer of a a troupe of children-actors performing in Nagoya at the Suehiroza; he makes his first stage appearance, playing under the name of Ichikawa Yoshimaru the roles of Sakuramaru and Shundô Genba in the classic "Sugawara Denju Tenarai Kagami". His elder brother is also a member of this troupe (his stage name is Ichikawa Rito). 1869 ~ 1876: he moves to Ôsaka and becomes a disciple of Onoe Shôroku, who gives him the name of Onoe Baikaku. He plays in hama shibai theaters like the Takeda no Shibai or the Tenma no Shibai. Later on, he breaks off with Onoe Shôroku and becomes a disciple of Nakamura Kanjaku III, who gives him the name of Nakamura Shikaku I.
January 1877: Shikaku plays at the Naka no Shibai in the drama "Meiboku Sendai Hagi". September 1885: Shikaku and Nakamura Umetarô go together to Tôkyô and join the Torikuma Shibai troupe at the Harukiza. November 1896: Shikaku takes part in the opening ceremony of the Miyatoza [more details]. 1904 ~ 1909: Shikaku works as a producer at the Shintomiza. October 1913: revival at the Kabukiza of the drama "Zôhiki", which belongs to the Kabuki Jûhachiban; Shikaku plays the role of the kôshitsu Atago-no-Mae [more details]. May 1919: Nakamura Shikaku I and his adopted son Nakamura Utanosuke III respectively take the names of Nakamura Denkurô VI and Nakamura Shikaku II at the Kabukiza; the new Denkurô plays the roles of Saruwaka Denkurô and Satsuki in the dramas "Tanzen Asaina" and "Ehon Taikôki". July 1923: he joins the touring troupe led by Ichikawa Sadanji II and suddenly dies in his inn in the city of Gifu. 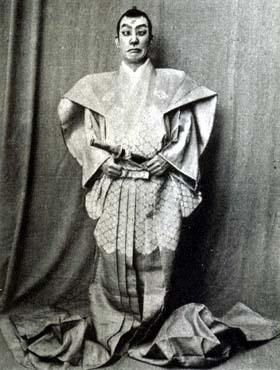 Nakamura Denkurô VI was a versatile actor, able to play a broad range of roles as a tachiyaku or an onnagata. In his latter years, he excelled in katakiyaku and fukeyaku roles. Nakamura Denkurô VI playing the role of Nikki Danjô in the drama "Meiboku Sendai Hagi"